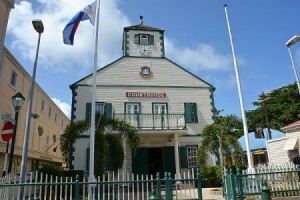 PHILLIPSBURG, WILLEMSTAD - On Tuesday, March 14, 2017 the court hearing in the Papegaai investigation took place in front of the judge of the Court of First Instance. In the Papegaai investigation D.J.E., C.J.P., J.P.R., A.T.M.R. and Casa Blanca NV are being suspected of human trafficking, illegal restraint at the Casa Blanca brothel, illegal firearm possession which have taken place between 2010 and 2015 and tax evasion (turnover tax and profit tax) totaling NAf. 430,000. The Prosecutor’s Office believed all charges are legally and convincingly proven and stressed that women were exploited for financial gain of the owners and managers of the brothel. The Prosecutor’s Office asked for 8 years in jail for A.T.M.R., 7 years in jail and a fine of NAf. 200,000, for J.P.R. 7 years in jail and a fine of NAf. 200,000, for C.J.P. 5 years in jail, for D.J.E. 4 years in jail and for Casa Blanca nv a fine of NAf. 30,000. The court will give its verdict on April 4. The case against M.J.P. In the same investigation was postponed until further notice for medical reasons.